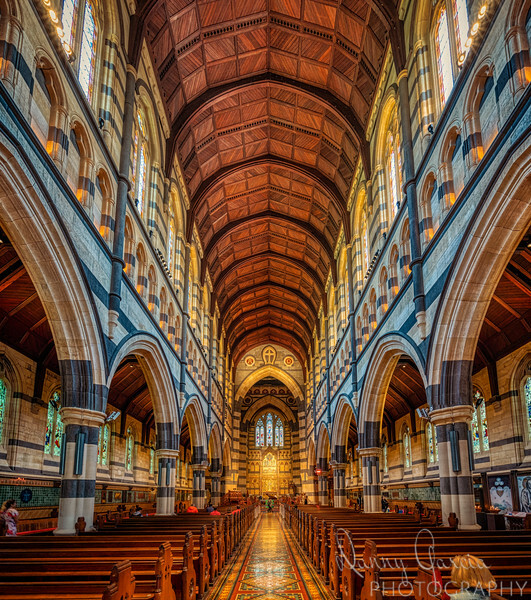 Saint Pauls Cathedral in Melbourne - interior photograph. St. Paul’s Cathedral is the seat of the Anglican Primate of Australia and home church for Anglicans in Melbourne and Victoria. St Paul’s Cathedral has been an integral part of Christian Melbourne since the city’s foundation: it stands on the site where the first public Christian services in Melbourne were led by Dr Alexander Thomson in 1836. From 1836 to 1848 the site on which the Cathedral stands served as a corn market for the growing city. In 1848, it was granted to the Anglican Church to build the bluestone St Paul’s Parish Church. Consecrated in 1852, St Paul’s Church was used until 1885 when it was demolished to make way for the liturgical West-end of the present Cathedral. SOURCE: https://cathedral.org.au/cathedral/history/ NOTE FORE PHOTOGRAPHERS: There is a fee for using your camera inside.